I am reporting from a factory’s office in Guangdong. It is 8:05pm. The temperature is 23 degree celcius. There are still officers stay back for work in the office of this factory at this moment…. This kind of scenerio is hardly to find in Malaysia…. no wonder China is classified as the factory of the world…. Stay Tuned for Interesting story…..
Master Soon reporting from a factory’s office in Guangdong, China….. I will be leaving for China on 25 Feb 2011, and, will be travelling extensively in China. If I could find the time, I will be posting interesting story and good photo from China…. In fact I had shared this feng shui case at http://www.mastersoon.com/2010/12/30/factory-office-feng-shui. The feng shui was audited on 30 Dec 2010. The business owner was so happy to tell me that he witnessed the feng shui result within 10 -14 days after my feng shui consultation. He said : ” Out of sudden, my business orders shoot up within 10-14 days after I did what Master Soon told to do. Those potential customers whom I hardly close the sales, strangely and automatically come to us and place orders. The business is so good until we have to reject the order due to our own stocks availability. However, this has opened up many new customer base for our company. Thank You very much, Master Soon “. The business owner is a typical chinese man. He is a bit tradition and appreciative. Due to the excellent feng shui result, he personally sent me chinese new year hamper. That day I was having a special workshop for 2 new students. He and his assistant drove us to a restaurant for an appreciative lunch. On 31 January 2007, I was interviewed by Guang Ming Daily 《光明日报》. At the interviewed I had predicted that would be a change of chief minister of Penang State. However, many people could not believe and understand my statement as there was no sign of a “change” of Chief Minister back to year 2006. However, the sign of Yijing 《易经》 had showed the sign of THE CHANGE. In year 2006 and 2007, there is no sign of election. For the last 50 years, Penang only experinced 3 Chief Minister. Logically, there will not be any change. Moreover, the Then Chief Minister , Khor Tzu Khoon was very firm and strong before general election Mac 2008. His middle name is Guan 《冠》 means imperial crown. This is abosolutely accurate and in line with my prediction, a new chief minister from other state, from opposition party. This is amazing…..
Master Soon Expressed His International Politics View in "Malaysian Business" Magazine, Edition Feb 2011. 孙老师发表他对世界政局的看法- Malaysian Business 2011年2月份 刊登. Feng Shui is NOT only science, but, much greater than science could understand. A master master must spiritual in any form of Daoistic, Buddhistic, Islamic, Christianistic, Judaistic, Hinduistic….. But, a master cannot be atheist…. If he is an atheist…. he is a fake master….. This is Penang Island, viewing from Northern Angle and Looking South Direction. The Yellow Square is the actual location of Teluk Bahang Dam. The construction was taken place during the reign of Former Penang State Chief Minister, Khor Tzu Khoon. The Teluk Bahang Dam was built and completed in 1999 to provide an alternative source of water supply to the Ayer Itam Dam and the Botanic Gardens Waterfall. The dam has a height of 58.5 meters and a length of 685 meters. In 2004, 25th of June, I was interviewed by Oriental Daily 东方日报 and I had predicted the weakening in term of political power of the then Penang State Chief Minister, Khor Tzu Khoon， or even worse, would make the down fall of the then Penang State political power. Why? Because the Dam construction went against the principle of political feng shui…..
2005 nothing happened politically. However, 2006,2007, 2008 were the years Malaysians and Penang people witnessed a lot of political incidents, political issues and political threats happened in Penang State in particular and Malaysia in general. Year 2006-2008 were the dark ages for the former Penang State Chief Minister, Khor Tzu Khoon(he was the chief minister of Penang from 1990-2008). He and his party lost ALL seats in State level in general election 2008. It was a drastic political change in 2008. Prior to that, 2006-2008 were a political period we Malaysians experienced many political issues in term of ethnic conflicts and also religion conflict. 2005年槟城政府没什么大事发生。一年过去了， 大家都问我测对不对。然而， 2006，2007 以及2008年切如我预言般的一一出现. 身为华人父母官，却不敢捍卫华人的权益；宁愿民族收百般的屈辱，也不为民族发出抗议之声。如果你是马拉西亚华裔，你一定会记得 2006-2008这间发生了何其多空前的种族歧视的严重事件. 但是没有一个华裔中央或省级/州级的部长出来抗议. 因为怕丢官. 2006-2008年发生了许多种族冲突和宗教冲突。最后，华裔投下手中一票；将他和他领导的政党，一个不留 埋葬他与其政党于 2008年全国大选. 2008年，他的政权完结,如同我2004年的预测. This is the photo of former chief minister, Khor Zhu Khoon. His political alliance, UMNO, also disrespected him buy destroying his ministerial portrait. 许子根 18年给马来政党办事做《跑腿省长》，但换来的是自己的官方照片给一个芝麻小官众撕裂侮辱。这证明他是削权傀儡，华裔轻视他， 他的马来人政治伙伴也羞辱他. In 21 January 2008, a local newspaper 《光华日报》 published my prediction on Malaysia politics. The Title was ” 2008 is dangarous to politician especially those born in year of HORSE”. 鼠年是政要的凶年. 3 days after my public annoucement, this statement came TRUE. It was a bit surprised to those who followed my prediction at the year 2008. The veteran Malay politician, Megat Junid (born in 1942, Horse) died on 24 January 2008. Tan Sri Megat Junid Bin Megat Ayub (1942 – 24 January 2008) was a Malaysian politician and direct descendant of Megat Terawis, a bendahara of Perak. Juind was first elected as a Malaysian MP at the same time that Mahathir became Prime minister of the country.He was appointed Primary Industries Deputy Minister in Mahathir’s government, just two years later. In 1986, Mahathir next appointed Junid to be his deputy in the Home Affairs Ministry.Junid’s tenure as the deputy Home Affairs minister was rocked by several controversies, including illegal immigration, a psike in illicit drug use and Operation Lalang of 1987.Junid was appointed to become Malaysia’s Domestic Trade and Consumer Affairs Minister in 1997.He served at that post for two years until he lost his seat in parliament to a PAS candidate in the 1999 “Reformasi” elections. Megat Junid died on 24 January 2008, aged 65, at the Pantai Medical Centre in Bangsar，Kuala Lumpur . Golden, Gold refered to Politic in term of Yijing terminology 《乾》卦在易经里指政权. Horse refered to Malay political power in term of Chinese calligraphical and pictographical hidden meaning. 《马》在汉字学指 马来政权. WHAT WAS THE POLITICAL OUTCOME IN MALAYSIA 2008? 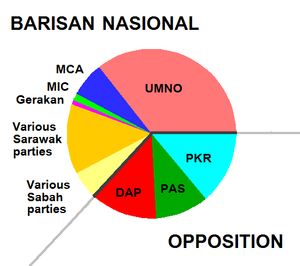 The ruling party, UMNO (Malay) lost the 5 States out of 13 States for the FIRST TIME to the OPPOSITION parties after 51 years of Independence. Among 5 States, Selangor State and Penang State are the economic generator to Malaysia GDP and the most Advanced State. The ruling party, UMNO lost 2/3 majority Parliamentary Seats for the FIRST TIME in Malaysia History. For the First Time UMNO (in Yijing symbolized by Horse 马) defeated so badly and many ministers lost in 2008. Point 5 shows that the ruling Front is getting only half of the political mandate from the people. Another sub topic is 千军万马撼江山. In English, it meant “Thousand and Millions of Army Marched and Threatened The Political Stability”. This was reflected at point number 5, where ruling parties lost almost 50% mandate of People. It meant that almost 50% people voted against ruling parties and supported opposition parties. The published official poetic prediction was accurately in line with the outcome. This is possible if you know Yijing very very well. Flying Stars feng shui system is unable to do this kind of prediction. Nevertheless, you can also do this kind of accurate national prediction if your master’ lineage is connected to…….. If a master can predict your personal luck, why he cannot predict the luck for a bigger issue, like The Destiny of A Country ???? Stay Tuned for more exciting information…….. This Yi, means "Change". The Chinese writing is pictographic. "Yi" is combination of 2 portions which upper & lower. The Upper partion is Sun, 日. The lower portion is Moon月. This is also the sequence of Later Heaven Bagua后天八卦. I have been thinking these few days of how can we approach Chinese Metaphysics from a better understanding points of view. Probably we should approach this knowledge from a healthier perspective. Feng shui is the most popular branch of Chinese Metaphysics known to the world. However, it is also the most polluted knowledge been presented to the world, be in Eastern or Western part of the world. Because it has been over commercialized since approx. 15 years ago without proper academic and profesional research. This kind of knowledge is spreaded to the various places, by mostly through commercialization. Although there are some sciencetists and profesors involving in feng shui teaching, yet, it is mostly also doing “passing” on the knowledge rather than evaluate and counter checking or put those theories under experiments. Modern people could not understand metaphysics due to many reasons. Regarding, Yijing prediction, a branch of Chinese Metaphysic is misunderstood, mostly due to absence of a proper metaphysics presentation and proper explaination. Perhaps, we need to detect the secretive truths of Yijing from its very original way. Language, is a very effective mean to understand a truth. Yet, Language is also an effective barrier to block the truth. The linguistic speed is always slower that mental speech. For example, sometime we find it is so hard and too slow to express our state of mind through linguistics or languages. Language is unable to express/describe/carry fully in relation to state of mind which is abstract and intangible. Even sometimes, language also cannot express objective matters/issues/happening. Therefore, it is very dangerous to trust(rely) the language to justify a truth. This is the reason why we have so many dispute/quarrel/conflict eventhough with WRITTEN CONRACT, as, contract which is recorded and understood by language is so easily been manipulated. It just simply explains that The Truth of the LAW, or the Truth of the Contract is “CHANGABLE”. Therefore, in real metaphysics, we always approach the TRUTH with NON-LINGUISTIC methodology, which are never appear in your class.. …………..
Stay Tuned If you want to know my insightful knowledge……. Firstly, Switch ON All Lights in the office, Especially Those Lights At Main Door, Pantry And Your Desk. No matter you are the boss or the employee, you need to re-charge your office feng shui after many days of holidays and breaks. Generally, there are 3 important steps to activate your office feng shui. Open Water Taps Fully And Let the Water Flows for 10 Minutes. Open All Windows Widely. Let the Wind Flows and Circulate the Stagnant Qi. Open the Water Tap Fully. Let the Water Flow for 10 minutes.